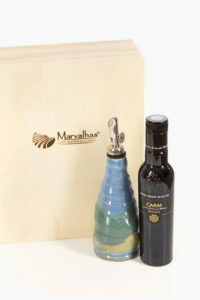 What a delightful pairing, our CARM Olive Oil Mini’s makes with an artisan hand-crafted Oil Carafe. Each Carafe is locally made, with no two alike, by Northern Illinois’ clay crafter, Marsha’s ClayArt. All packaged in our monogrammed wooden presentation box. This is truly a Marvalhas Gift. 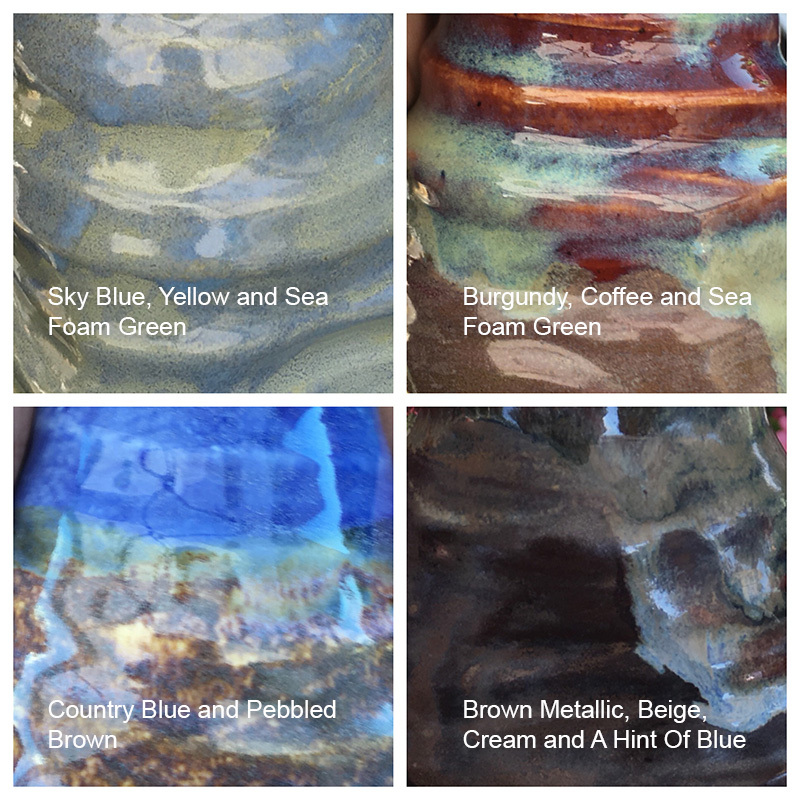 This Marvalhas collection is the Best we have to offer. Sporting the Black label, Gold Award winning Præmium, is Cold Pressed, Extra Virgin, D.O.P. Certified, as well as, Organic. Being a robust, balanced olive oil that begs to soak into warm, crusty bread, … maybe splashed over a salad. Quinta do Bispado, the Silver Award winner presented in the Black bottle, is also Cold Pressed and Extra Virgin. With a slight peppery flare, its vibrant flavor, complements all to which it is added. MiaBella Tradiitonal Balsamic’s Black liquidy goodness enhances vine ripe tomatoes, to perfection. 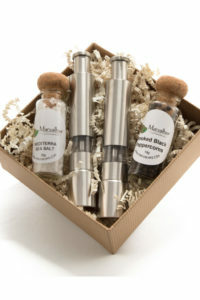 Mini and powerful, the Thumb Grinder set, with Mediterra Sea Salt and 4 Color Peppercorns, allows you individual seasoning at it’s Best. Add in the Stoned (that means without the pit) whole olives, with their Black olive intensity that can be eaten like candy straight from the jar and you have yourself a stellar cast. BTW did you catch the reference to MIB ? Once expensive and difficult to obtain, sea salt and peppercorns were highly valued trade items, and were considered a form of currency by certain peoples in anceint times. 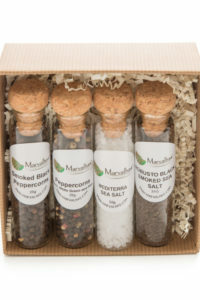 A fabulous gift or luxurious treat for yourself, included in this gift set are 4 vials, providing a Flavor Burst to all your favorite meals; includes, 1 Mediterranean solar evaporated sea salt, 1 exotic Smokey black whole peppercorns, 1 Peppercorn blend (black, white, green and pink) and 1 Robusto Cold Smoked sea salt. Savory by definition means, full of flavor, delicious and tasty. 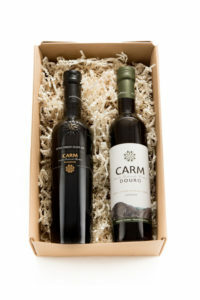 You get to pick two 250ml CARM Olive Oil from our olive oil Family. Is your “Go To Olive Oil” Præmium, with it’s dipping oil robustness, or Quinta do Bispado with it’s black peppery zesti flavor? Do you prefer our namesake Marvalhas, liquid buttery goodness or would you rather experience Quinta do Côa’s nutty essence? Then, what pairs better with a savory olive oil, then a Traditional Balsamic like MiaBella? The unadorned bottle of MiaBella Traditional Balsamic shyly holds liquid that has intensified over time. Most are familiar with this balsamic for it’s use in making a caprese salad or bruschetta. Add in Portuguese Flor de sal, or “Flower of Salt”, from the southern region of Portugal, called the Algarve. This sea salt is gathered using hand rakes when it floats to the surface of shallow salt-pan fields. Flor de Sal is renowned for its texture, like tiny snowflakes and it’s flavor, softer than other salts, with a hint of the sea. Presented in a box made entirely from cork, to display proudly on your table, is distinctively unique. Each item on their own is full of flavor, all together flavory – which is not a real word, but should be. 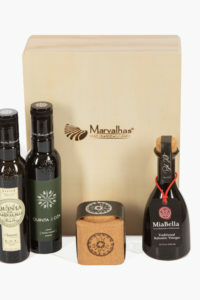 MiaBella Traditional Balsamic and Flor de Sal in cork, with a monogrammed wooden box. We have been told, one of the hardest parts of selecting a CARM Olive Oil is having to choose only one oil. With our Marvalhas Box of Variety, no oil has to be left behind. You get each of our Family’s single sourced, Cold Pressed, Extra Virgin olive oils in our new 250ml Mini bottles. Being our most bold certified Organic olive oil, we suggest using Noble Præmium table side, as a finishing oil to be poured directly on your meal or as a dipping oil, with the ability to stand up to your favorite cheeses, herbs or spices, added to your dipping dish. 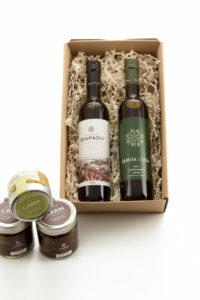 Our Single Estate, Quinta do Bispado olive oil adds a subtle peppery Wow to soups, stews, sauces and pasta. The Certified Organic Marvalhas, so special we named our Company after it, is smooth, full bodied with a slight butteriness, perfect when used to roast vegetables and adds depth to a homemade salad dressing. Another of our single Estate oils, silky and nutty, Quinta do Côa, is perfectly palatable straight from the bottle, plus adds a little something extra to roasted potatoes or rice dishes. 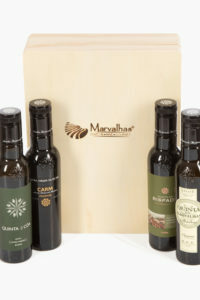 This presentation of our Olive Oil Family, all together, just as a Family should be, is a Favorful Gift. 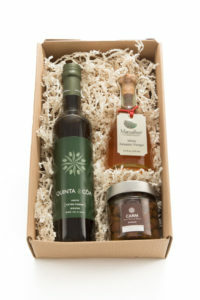 ‘The Marvalhas Box of Variety’ set includes : 250ml Mini bottles of Præmium, Qunita do Bispado, Marvalhas and Quinta do Côa Olive Oils enclosed in a monogramed wood box.